Map of Wilderking Court circa 2E 582. The Wilderking Court (also called the Court of the Wilderking, or simply, The Court) is a smaller area in the region of Greenshade, which consists of southeastern Valenwood. 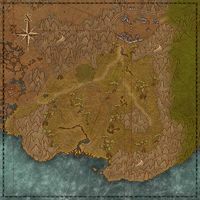 The cities of Greenheart and Marbruk are anchored on each side of the region, with the latter found on the crossroad towards Grahtwood. The name earns its name through the presence of the Wilderking, a god worshipped by the tribal Wood Elves that live in the region, such as the ones that live in Bramblebreach and the Shrouded Vale. The Wilderking is worshipped across the land, and his will is enforced through the Hollow, stone constructs that live in the land, in ruins such as Shadows Crawl and the Labyrinth. In 2E 582, the First Aldmeri Dominion had built the city of Marbruk on the northern edge of the Wilderking Court, where it became their foothold in the region. At this point, the tribal clans of the Court were unaligned with the Aldmeri Dominion, unlike the rest of Valenwood. They only served the Wilderking. An Agent of the Dominion was sent on a mission to gain an audience with the Wilderking, and ultimately uncovered a plot conceived by the Veiled Heritance to kill the Wilderking. In the end, the Wilderking had died and was replaced by Aranias, who would be named the Wilderqueen. The queen, along with the rest of the Wilderking Court, pledged allegiance with the Aldmeri Dominion. This page was last modified on 18 February 2019, at 17:46.